This novel offers an incredible portrayal of this world and its precarious balance between feminism and misogyny, offering a skilful take on female empowerment and agency with a great pair of main female characters. Why did I read this book: I love Justine Larbalestier’s books and this one sounded just up my alley. I always find interesting to hear about the ideas behind stories. 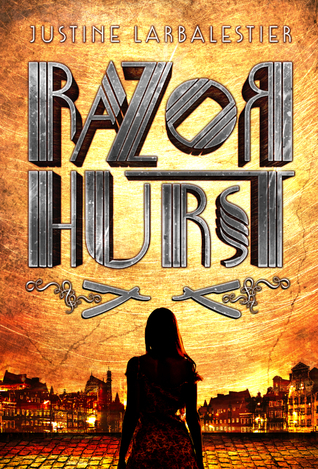 In a recent Big Idea essay, Justine Larbalestier talks about how Razorhurst starts with a place, rather than with a character’s voice like her previous novels. The story goes that, upon learning that her gentrified Sydney neighbourhood of Surry Hills was home to slums, violent gangs, brothels and shady business ran by crime ladies back in the 20s and 30s, she was moved to learn more about its past and that road led down to Razorhurst. Kelpie grew up in the streets of Sydney, a malnourished urchin that never knew her parents, doesn’t know her own age and can barely read. Kelpie has seen ghosts all her life and was effectively brought up by some of the friendly ones. The not so friendly ones have been a source of torment she can’t block out. Dymphna is a charming, beautiful dame, the most famous prostitute of these parts. She too can see ghosts but unlike Kelpie she has learned to cope with their existence by all but ignoring them. Caught between two competing mob bosses – Gloriana Nelson and Mr Davidson – Dymphna is the former’s “Best Girl” and the latter’s obsession. Her ambition is to become a boss herself and to run Surry Hills but things don’t work according to plan. Razorhurst is a snapshot of this particular neighbourhood in the 30s and it follows Dymphna and Kelpie as they cross paths for the first time over the murdered corpse of Dymphna’s lover Jimmy and then must run for their lives. Taking place within the hectic, violent and engrossing hours following that encounter, the novel also offers a vibrant – albeit brutal – account of their lives leading to that point as well as of the lives of many of Surry Hill’s inhabitants with short interludes inbetween chapters. Also, ghosts. It makes perfect sense actually, the addition of ghosts here, given the nature of this story as it is so very easy to imagine not only this place but also these girls to be haunted. And haunted they are: both Kelpie and Dymphna can see and talk to ghosts, an ability they share, a secret they both carry. This shared curse is perhaps the only thing they have in common beyond the way that Razorhurst has affected their lives because everything else sets them apart: from their own bodies to their demeanour, from their past to their possible future. This is probably my favourite thing about Razorhurst: these two girls and the way they come together. The most affecting and heart-breaking element of their portrayal is the question of age: both barely in their teens and yet circumstances – tragedy and poverty – have dictated their actions and as such Kelpie is almost a child whereas Dymphna is treated as an adult. Dymphna and Kelpie’s lives are as tragic as they come but in no way less than fully rich and engaging. The most heart-wrenching thing of all: Dymphna is adamant to become Kelpie’s protector when she herself needed to rely on others for her own protection in a world that thinks less of women even when they are powerful and famous. This novel – among other things – offers an incredible portrayal of this world and its precarious balance between feminism and misogyny, offering a skilful take on female empowerment and agency with a great pair of main female characters. Razorhurst is another excellent book from a favourite author and a Notable Book of 2015.
Notable quotes/parts: Check out this great excerpt from Dymphna’s perspective. question: do kelpie and dymphna get together? i want to read this book and i found it while looking for lgbt fiction. if they dont, ill probably still read it because i’m a sucker for mob/mafia stories, but it’d be cool if they did.